Last month at Google I/O, the company released an updated version of Earth for Android to accommodate a new 3D imaging feature for select cities. Today that update has come to iOS, on both iPhone and Android, and brings some new cities — “Boulder, Boston, Charlotte, Lawrence (Kan.), Long Beach (Ca. ), Los Angeles, Portland (Ore.), San Diego, Santa Cruz, Tampa, Tucson, and the San Francisco Bay Area (including the Peninsula and East Bay) as well as Rome, Italy” — to the table. Google has also added a “tour guide” to select cities, picking top spots to gander, each of which comes with short snippets from Wikipedia to round out the experience. 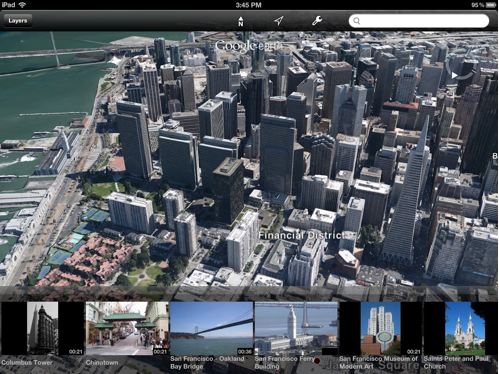 If you haven’t already downloaded Google Earth, get it for iOS and Android. The 3D imaging capabilities are only available for the iPhone 4S, iPad 2 and new iPad due to high GPU requirements.